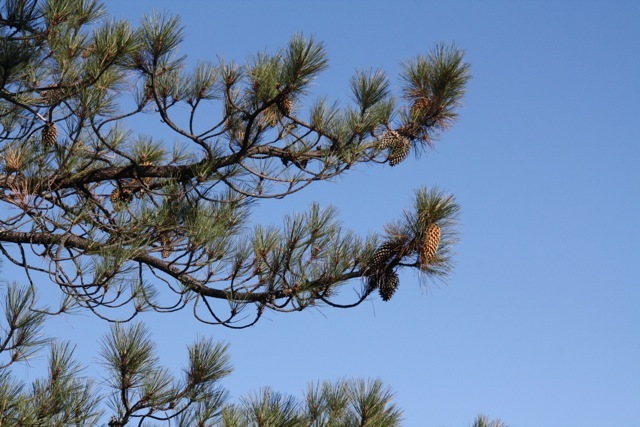 Since we’ve been talking about pine trees this week… Here is Coulter pine (Pinus coulteri, also known as big cone pine), which I saw growing along the road to the east peak of Mt. Tamalpais. You can tell it from other native pines by its looong needles that are bundled in groups of three, and also by its elongated cones that are composed of sharp hook-shaped scales. This tree is native to California but not to Marin county; its natural range starts just south of here in Contra Costa and extends down to Mexico. It usually is found scattered in chaparral or forest. 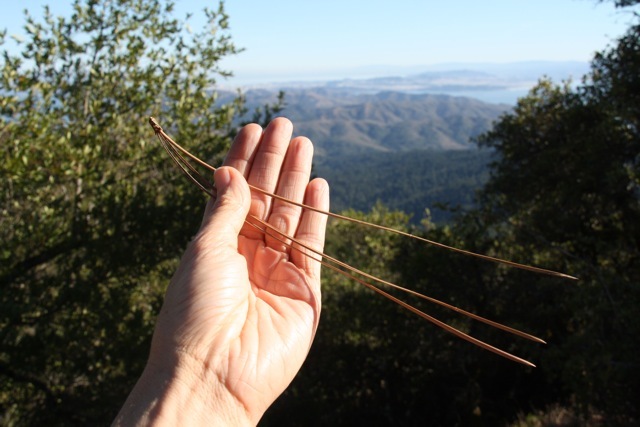 Native Americans used the needles for making baskets, and one source says that it (the seed?) was also used as a food. It isn’t particularly valued for wood.